Quarterly issues of Ethisphere Magazine will feature an article from a Chief Legal Officer, drawing from the ACC membership base – the world’s largest community of in-house counsel. 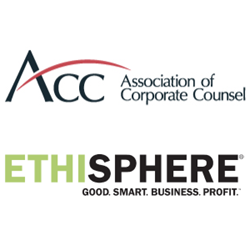 The Ethisphere Institute, a global leader in defining and advancing the standards of ethical business practices, announced a year-long collaboration with the Association of Corporate Counsel (ACC) to address ongoing challenges and best practices in global compliance and ethics. ACC is the world’s largest organization dedicated exclusively to in-house counsel, with more than 40,000 members in 85 countries. Both organizations work closely across membership bases that include CEOs, general counsel, chief compliance officers, and other business and in-house legal executives to go beyond what companies are already doing to preserve corporate integrity and reputation. Quarterly issues of Ethisphere Magazine will feature an article from a Chief Legal Officer, drawing from the ACC membership base – the world’s largest community of in-house counsel. Richardson contributed to Ethisphere’s 10th Anniversary Issue, the first issue of 2016, and ACC members around the globe now have digital access to "Ethisphere" magazine. “What I have found refreshing about the conversations we are driving with Ethisphere is that we are able to speak to company leaders in an entirely new way,” said Veta T. Richardson, ACC president and CEO. “There will always be regulatory and legal considerations for companies to consider, but what we see from GCs, across the C-suite and the boardroom, increasingly, is that these conversations are only enriched when ethics becomes integrated in every facet of the organization, especially at the top level of decision making." The Association of Corporate Counsel (ACC) is a global legal association that promotes the common professional and business interests of in-house counsel who work for corporations, associations and other private-sector organisations through information, education, networking opportunities and advocacy initiatives. With more than 40,000 members in 85 countries, employed by over 10,000 organisations, the ACC connects its members to the people and resources necessary for both personal and professional growth – By in-house counsel, for in-house counsel.® For more information, visit http://www.acc.com and follow the ACC on Twitter: @ACCinhouse.